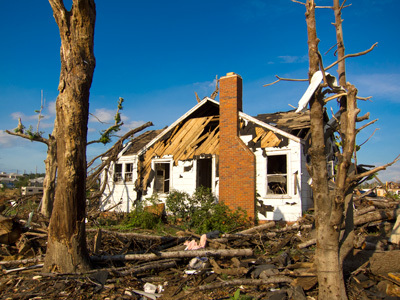 Stripped trees and a home destroyed by a tornado that struck a neighborhood near Forest Lake Drive on April 27, 2011. Tuscaloosa, Alabama, July 16, 2011, 4:42 p.m., Canon PowerShot S95, f/4, 1/800 sec., ISO 80.Photo by Christopher Mardorf / FEMA. Downed trees and home destroyed by a tornado that struck a neighborhood near Elm Drive on April 27, 2011. Tuscaloosa, Alabama, August 2, 2011, 3:21 p.m., Canon 5D Mark II, EF 24-105 mm f4.0L IS USM, f/13, 1/400 sec., ISO 400. Photo by Christopher Mardorf / FEMA. Residential roof damaged by a tornado that struck a neighborhood near Elm Drive on April 27, 2011. Tuscaloosa, Alabama, August 2, 2011, 3:24 p.m., Canon 5D Mark II, EF 24-105 mm f4.0L IS USM, f/10, 1/320 sec., ISO 400. Photo by Christopher Mardorf / FEMA. Street stop sign damaged by a tornado that struck a neighborhood near Forest Lake Drive on April 27, 2011. Tuscaloosa, Alabama, July 16, 2011, 4:45 p.m., Canon PowerShot S95, f/4, 1/500 sec., ISO 80. Photo by Christopher Mardorf / FEMA. Home stripped from its foundation by a tornado that struck a neighborhood near Forest Lake Drive on April 27, 2011 Tuscaloosa, Alabama, July 16, 2011, 5:25 p.m., Canon PowerShot S95, f/4, 1/400 sec., ISO 80. Photo by Christopher Mardorf / FEMA. Tree uprooted by tornado that struck a neighborhood near Forest Lake Drive on April 27, 2011. Tuscaloosa, Alabama, July 16, 2011, 5:14 p.m., Canon PowerShot S95, f/4, 1/200 sec., ISO 80. Photo by Christopher Mardorf / FEMA. Home crushed under the weight of a tree felled by tornado that struck a neighborhood near Forest Lake Drive on April 27, 2011. Tuscaloosa, Alabama, July 16, 2011, 5:10 p.m., Canon PowerShot S95, f/4, 1/100 sec., ISO 80. Photo by Christopher Mardorf / FEMA. Home destroyed by tornado that struck a neighborhood near Forest Lake Drive on April 27, 2011. Tuscaloosa, Alabama, July 16, 2011, 4:53 p.m., Canon PowerShot S95, f/4, 1/250 sec., ISO 80. Photo by Christopher Mardorf / FEMA. Rubble and debris from a tornado that struck a neighborhood on Lamplighter Lane on April 27, 2011. Birmingham, Alabama, July 23, 2011, 3:42 p.m., Canon 5D Mark II, EF 24-105 mm f4.0L IS USM, f/8, 1/250 sec., ISO 400. Photo by Christopher Mardorf / FEMA. Home split in half by a tornado that struck a neighborhood near Forest Lake Drive on April 27, 2011. Tuscaloosa, Alabama, July 16, 2011, 4:57 p.m., Canon PowerShot S95, f/4, 1/640 sec., ISO 80. Photo by Christopher Mardorf / FEMA. Home destroyed by a tornado that struck a neighborhood near Forest Lake Drive on April 27, 2011. Tuscaloosa, Alabama, July 16, 2011, 4:57 p.m., Canon PowerShot S95, f/4, 1/400 sec., ISO 80. Photo by Christopher Mardorf / FEMA. Automobile destroyed by a tornado that struck a neighborhood near Fifth Street on April 27, 2011. Tuscaloosa, Alabama, August 2, 2011, 2:58 p.m., Canon 5D Mark II, EF 24-105 mm f4.0L IS USM, f/11, 1/400 sec., ISO 400. Photo by Christopher Mardorf / FEMA. Apartment destroyed by tornado that struck a neighborhood near Forest Lake Drive on April 27, 2011. Tuscaloosa, Alabama, July 16, 2011, 4:36 p.m., Canon PowerShot S95, f/4, 1/640 sec., ISO 80. Photo by Christopher Mardorf / FEMA. 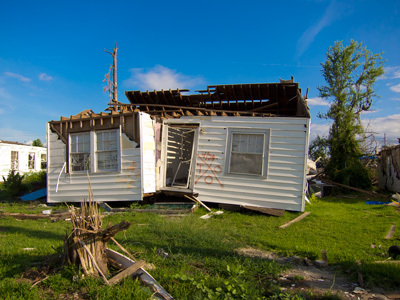 Home split in half by tornado that struck a neighborhood near Forest Lake Drive on April 27, 2011. Tuscaloosa, Alabama, July 16, 2011, 4:50 p.m., Canon PowerShot S95, f/4.5, 1/1000 sec., ISO 80. Photo by Christopher Mardorf / FEMA. Fallen tree and home destroyed by tornado that struck a neighborhood near Forest Lake Drive on April 27, 2011. Tuscaloosa, Alabama, July 16, 2011, 4:53 p.m., Canon PowerShot S95, f/4, 1/640 sec., ISO 80. Photo by Christopher Mardorf / FEMA. Tuscaloosa water tower untouched by the violent tornados that struck the city on April 27, 2011. Tuscaloosa, Alabama, August 2, 2011, 3:40 p.m., Canon PowerShot S95, f/4, 1/500 sec., ISO 80. Photo by Christopher Mardorf / FEMA. New home built by Habitat for Humanity after a tornado destroyed many of the homes on Fifth Street near Elm Drive. Tuscaloosa, Alabama, August 2, 2011, 11:34 a.m., Canon 5D Mark II, EF 24-105 mm f4.0L IS USM, f/14, 1/400 sec., ISO 400. Photo by Christopher Mardorf / FEMA. Woman's shoe scattered by a tornado that struck Birmingham's Pratt City on April 27, 2011. Birmingham, Alabama, July 17, 2011, 3:55 p.m., Canon PowerShot S95, f/4, 1/100 sec., ISO 80. Photo by Christopher Mardorf / FEMA.